Very visible at any location, SIGNARAMA Flags are a wonderful tool to use to catch attention. Our flags are available in many sizes and colors, including custom made with your event logo, company seal or motif's complementary colors. SIGNARAMA has the experience to help you maximize your available space and decorate and advertise with flags. SIGNARAMA Flags and SIGNARAMA Hanging Banners are popular with many companies large and small to represent their image and products. You'll see flags at furniture stores, clearance centers, appliance retailers, fireworks stores, home improvement centers, car sales lots, new model home sites, sports centers, and fitness clubs. Businesses hosting temporary events are also believers in the effectiveness of SIGNARAMA's line of flag products. We routinely serve as flag suppliers to fairs, amusement parks, bazaars, green markets, charity auctions, grand openings, and special sales. Flags are commonly used on a building's exterior for identification purposes or in conjunction with promotions. SIGNARAMA also provides flags for indoor use, boardrooms, display centers, stages, demo areas, meeting places, and auditoriums. 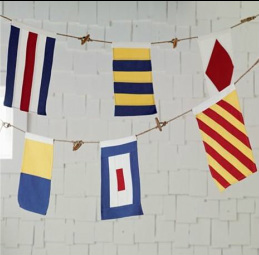 Flags can be permanently mounted on walls, floor stands, or hung from ceilings. SIGNARAMA local sign centers can work with you to determine which method of display is most effective, along with sizing, colors, and mounting options. Trust the company that has sold and installed flags all over the world to help boost awareness and impress customers - SIGNARAMA is the best source for flags and hanging banners. Flag ownership and use is sometimes locally enforced through permitting. A quick call to any of our SIGNARAMA sign centers will put you in contact with knowledgable professionals that can answer your questions and share local regulations for flags and hanging banner products. Most flags carry excellent durability for outdoor use and weather resistance. Other flags in our available inventory include ceremonial flags for indoor only display and use. SIGNARAMA is also a proud retailer of eco-friendly flag and flag materials, ones that are biodegradable and use natural materials. All flag orders are handled with a very fast turnaround time, including custom logos and colors. Let SIGNARAMA show you the way to employing flags and hanging banners for your business or next event.